When a musical legend comes to town, you don’t want to miss the show. When the concert is in the intimacy of a club seating fewer than 100, you make your reservations immediately. 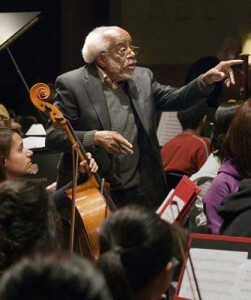 That is the setup for the return to Montreal of pianist Barry Harris, 83, an active teacher and performer. When we last saw him in the late 1980s, fans were packed in, standing next to the piano at Club 2080 on Clark. Harris not only played with Monk, he shared living quarters with him in the 1970s at the Weekhawken, New Jersey, home of jazz patroness the Baroness Pannonica de Koenigswarter. Guess what? Harris still lives there, and when we spoke, the conversation turned naturally to tales of Monk, the unique pianist and composer of such classics as Round Midnight, Straight No Chaser, Ruby My Dear and Pannonica. He also discussed gearing up for his performance: “I don’t believe in a set list. I just sit down and start playing. One is always nervous, but the more you do, the less the nervousness shows. Harris’s mother, Bessie, was a church pianist who taught him to play, but he makes a clear distinction between the spiritual tradition and his own style. Harris is from Detroit, which spawned such great jazz names as Thad, Hank and Elvin Jones, Tommy Flanagan, Kenny Burrell, Yusef Lateef and Kirk Lightsey, but Harris says there was nothing special about the city. Harris relies on the standards—the so-called American songbook—for his performances and he sees this remarkable collection as part of what is now a classical tradition. “I’m a jazz musician, but a classical jazz musician. What the Europeans did, very wrongly, is they stopped improvising. That’s what we started in the U.S.A. Most of the composers of the standards were of European origin. Harris has no time for some of the simpler tunes that became popular, post-bop. “Can you hear Charlie Parker playing Watermelon Man (the funky Herbie Hancock tune)? Get outta here. Even The Sidewinder (Lee Morgan) or Dis Here Dat Dere (Bobby Timmons). These cats started writing all this funny kind of music because they really didn’t know what jazz was about. “When Charlie (Bird) Parker died, Miles didn’t carry on the tradition. Max (Roach) didn’t carry on the tradition. Coltrane knew who the greatest musician was—he was standing around listening to Bird like all the rest of us. Monk was unique. “I think he is the only cat that said one day, ‘I am going to play different from everybody.’ And he did that, and he had a benefactress who helped him. “I remember once Monk was playing My Ideal. Then I sat down and played My Ideal and we went on for an hour, back and forth, playing My Ideal. That was the best time I had with Monk. The piano Monk played still is in the house they once shared, but Harris prefers his own Petrof grand. He does not rest on his considerable laurels: he is booked to perform and teach in Europe and Japan. Retirement is not part of his vocabulary. The Upstairs series during the Montreal International Jazz Festival features outstanding artists best appreciated in the superb vibe and acoustics of our finest jazz club, at 1254 Mackay. Barry Harris, with Ray Drummond (bass) and Leroy Williams (drums) performs June 28 and 29 at 7 and 9:45 p.m. Each set is $45 plus taxes. June 29, Harris gives a three-hour master class at noon. Bring your instrument. $25. June 27, the outstanding Israeli-born guitarist Gilad Hekselman with his New York trio, 7:30 and 9:45 pm. $22.50 plus taxes per set. July 3 and 4, veteran vocalist Helen Merrill, 82, with her trio, 7 and 9:45 pm, $45 plus taxes per set. July 5, pianist Bill Charlap, master of the standard repertoire, 7 and 9:45 pm, $30 per set. 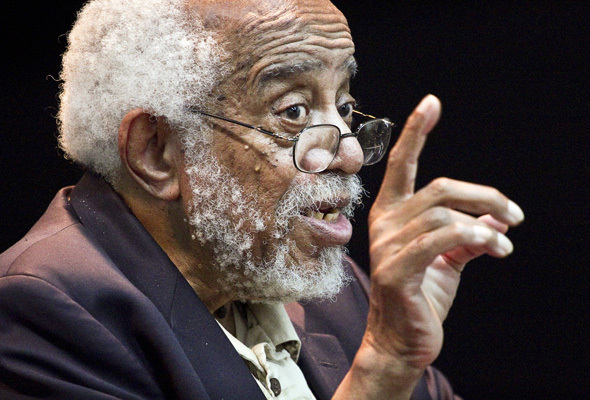 Be the first to comment on "American songbook: An intimate chat with jazz pianist Barry Harris"